The GWAA is presented to an outstanding graduating student in each school of the university; recipients must have demonstrated leadership abilities and a commitment to GW and its community. This award, granted by the GW Medical Alumni Council, is given annually to members of the graduating class who have shown exceptional leadership ability, the potential for continuing involvement and leadership as alumni, and the likelihood of bringing honor to the medical school. Established in 1991, the annual Robert Keith Cole Memorial Award is given to a medical student who possesses several of Robert Cole’s noteworthy attributes, such as dedication to community service, sensitivity to the LBGT community, and academic excellence. This award is presented annually to the graduating medical student who exemplifies leadership qualities and academic achievement. Created in 1965, this award is presented annually to an SMHS student who has submitted the best essay based upon original investigation. At the bequest of John Ordronaux, this award, starting in 1909, is presented to the valedictorians of both the School of Medicine and Health Sciences and the GW Law School. This annual award is given to the graduating medical student with the highest grade point average. This award, presented annually, recognizes a graduating student who has demonstrated clinical excellence and compassion in the delivery of care, and who has shown respect for patients, their families, and health care colleagues. 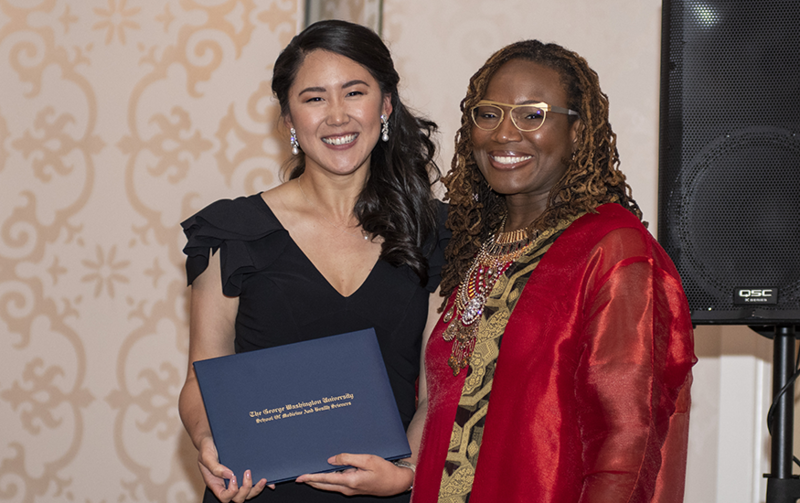 The Rosenberg Award in Dermatology is given to a senior medical student who has shown the greatest interest, proficiency, and scholastic achievement in dermatology. Given annually to a member of the graduating class, this award recognizes the student who has demonstrated significant interest in and aptitude for the specialty of emergency medicine. This award is presented to a graduating medical student who has demonstrated outstanding proficiency in the practice of emergency medicine. The ACEP award is given in recognition of leadership and excellence to select ACEP members. Created in 1965 by a gift from E.M. White in honor of Benjamin Manchester, M.D., this annual award is presented to a member of the graduating class who has shown outstanding work and who shows promise of real humanitarianism in his or her profession. This award, given annually, recognizes a student’s dedication and commitment to the principles of global health and the improvement of the quality of life of those in need around the world. The recipient must also demonstrate leadership qualities and undertake projects that make a lasting impact on the country served and the GW School of Medicine and Health Sciences. This award is presented annually to a member of the graduating class who has demonstrated exceptional proficiency in the field of preventive medicine. Established by the Bloedorn Foundation, this award is given annually to a graduating medical student who has demonstrated interest and ability in the field of primary care. The Mark Millen Memorial Award is presented annually to a member of the graduating class who has demonstrated exceptional proficiency in the field of rheumatology. This award is given annually to a graduating medical student for outstanding academic achievement in internal medicine. Established by Sheila Sloane Dusseau, this award is given annually to a member of the graduating class who has demonstrated outstanding sensitivity to neurologic patients and superior knowledge of neurology. This annual award is presented to a graduating medical student who has shown promising career potential in neurology. Established in memory of gynecologist and professor Bernhard Zondek, M.D., the eminent discoverer of the endocrinology of the human female reproductive cycle, this annual award is presented to a graduating medical student who has attained commendable knowledge and understanding of the field of female endocrinology. This award is given annually to a member of the graduating class who has demonstrated outstanding ability in the field of obstetrics and gynecology. Established by Mrs. Lawson in memory of her husband, who was a distinguished member of the SMHS faculty, this award is presented to a graduating senior who has demonstrated exceptional proficiency in the field of obstetrics and gynecology. This annual award, given to a member of the graduating class, recognizes outstanding ability in the clinical aspects of orthopaedic surgery. Established in honor of the late William Newman, MD, a distinguished surgical pathologist, this eponymous award is given every year to a graduating medical student who has demonstrated great aptitude and interest in the field of pathology. This annual award is presented to members of the graduating class who have demonstrated outstanding ability in the specialty of pediatrics. The annual Jerry M. Wiener Award in Psychiatry is given to a graduating senior who has performed at an outstanding level in psychiatry and who plans to pursue a career in the field. This award, given in honor of Navdeep S. Kang, a fourth-year medical student who passed away after a motorcycle accident in 2015, is given to a graduating senior who has demonstrated an interest in a psychiatry career. This award is given annually to a senior medical student who has demonstrated exceptional proficiency in the field of surgery. The Paul L. DeWitt Award in Surgery is presented every year to a member of the graduating class who has demonstrated outstanding ability and future potential in the specialty fields of surgery. This award is given annually to a student who has shown excellence in the field of anesthesiology. This award, presented annually to a member of the graduating class, recognizes outstanding achievement in the field of urology. The annual Excellence in Public Health Award is given to the senior medical student who has demonstrated excellence in the field of public health. This award, presented in honor of Hope Jackson, MD ’09, RESD ’16, CERT ’14, is presented to the graduating medical student who exemplifies Jackson’s character, particularly her humility, compassion, exceptional patient-centered care, and devotion to mentoring other students and residents.